Hunting for Funko Pops can be one of the most exciting and frustrating aspects of the hobby. On the podcast, we have referenced a tool called Brickseek a number of times (check out EP2 What the Funko is Going On). Brickseek can be your best friend when hunting for the notoriously difficult to find, Target exclusive pops. So, what exactly does Brickseek do, what does it not do, and how do you use it effectively. Let’s take a look and figure out how to use Brickseek. In a nutshell, Brickseek is a very powerful inventory tracking tool, price monitor, and community platform. If you are on the hunt for a specific pop all you need is a product number and a zip code. With Brickseek you are able to locate what stores have your item in stock in a given area and a rough estimation of quantity. If your product is not in any stores in your area you can also set up email alerts to notify you when it is restocked. What Does Brickseek Not Do? Unfortunately, Brickseek does have it’s limitations when it comes to checking inventory at your local store. Before October of this year, you were able to check semi-accurate inventory numbers for Target. This was great because Target’s actual website was little to no help. As more people started to use Brickseek, Target’s corporate office began to discover that it was causing issues with aggressive customers coming in and demanding store associates locate a certain product due to Brickseek stating a certain number should be on hand. As you may guess no inventory system is perfect and mixing that with a very passionate fanbase of any product can cause issues. To combat this Target no longer allows Brickseek to publish on hand amounts. Instead, you are only able to see if an item is In Stock, Limited Quantity, or Out of Stock. So what do these 3 inventory statuses mean? In Stock – If you see an inventory status of in stock then you have a very high chance that your store is going to have these on hand. Limited Quantity -This is not a good sign. A quantity of limited means that your store is reporting at least half of their original shipment has been sold. Out of Stock – This is what everyone is going to dread seeing. This means that your store is reporting none of your specific items are in stock. This isn’t always bad, as inventory isn’t always 100% accurate. Just be aware that chances are your store either does not have this item or if they do it has not been scanned into their system from the truck. As we have said a number of times on the podcast, don’t use Brickseek as your end all be all resource. It is merely another tool in your arsenal that increases the likelihood if locating those hard to find Funko Pops. Is This Awesome Tool Free? The easy answer to that question is “Kind Of”. On the surface, the basic features of Brickseek are 100% free. Anyone can go to the website with a DPCI for Target or a UPC for Walmart and check to see if that product is in stock in their local area. You can even create a basic account to set up notifications that alert you when your local stores have a change in inventory status. The sad part is, to get the most out of Brickseek, you need to upgrade your account to either the Premium or Extreme Dealhunter plan. If you are only going to be using Brickseek for hunting Pops, then the Premium option will be more than enough. 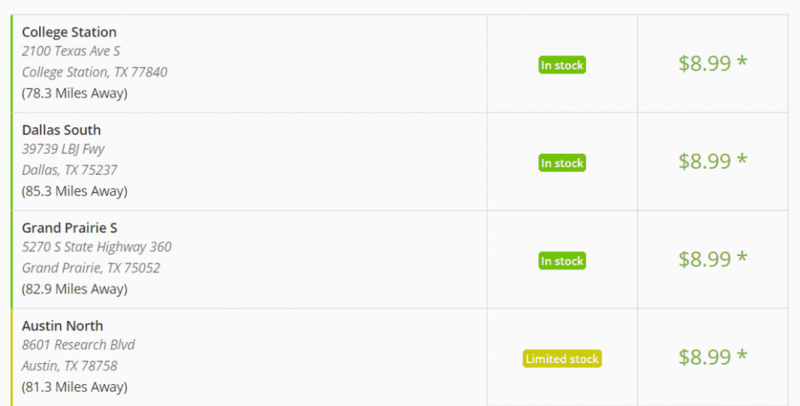 If you are interested in taking part in Brickseek’s community and finding deals on products, in general, you need to go for the Extreme plan. To make it easier, I am going to show you how to use Brickseek beginning to end. I am already logged into my account, I will be using a basic account, as I am sure many will be doing as well. 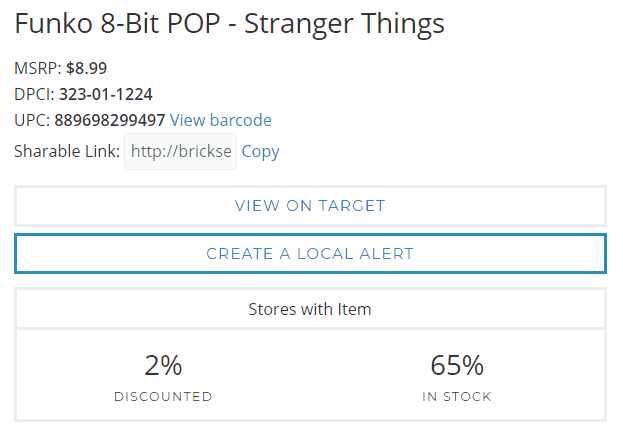 Navigate over to https://brickseek.com/target-inventory-checker/ since we will be checking the inventory for a Funko Pop at Target. Remember, you can also check Pops from Walmart with this tool. Next, you need to locate the DPCI number for the pop you are looking for. The easiest way to find the DPCI is going to be any of the many Funko Facebook Groups or on the Pop Collectors Alliance Facebook Page. For this example, I will be looking up the Funko Pop 8-bit Stranger Things figures. All of the figures in the series use the same DPCI, 323-01-1224. This is another glaring flaw with Target’s inventory system. 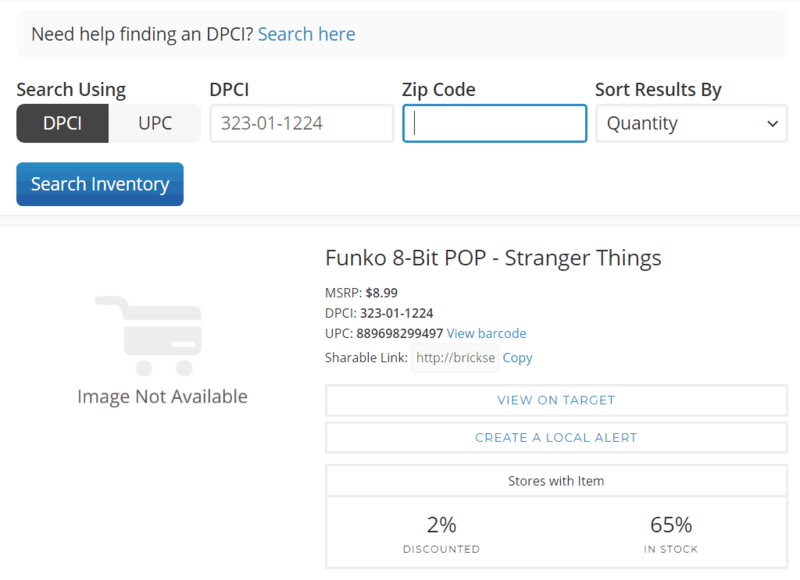 Tracking down the exact Pop you are hunting gets to be a challenge when you can have up to 10 different Pops sharing the same inventory ID number. Once you are on the inventory tracking page for Target on Brickseek just enter your DPCI and zip code into the app. Based on the inventory counts of Targets in your area you will be given posted prices and the estimated inventory counts of your product. I say estimated counts because as we stated above, Target no longer gives the exact number of items in stock. Instead, you will get In Stock, Limited Stock, and Out of Stock. Remember that these counts aren’t 100% accurate so be cautious. Make friends at your local Target, check back regularly, and stop by your local Target on a regular basis to check and see what new is on the shelf. The last thing, and quite possibly your best friend on Brickseek is the notification feature. If the Pop that you are looking for isn’t located anywhere near you, just create a Local Alert. This feature will notify you once a week if there are inventory changes to a specific tracked item. Unfortunately, you can only get notifications on one item at a time and because you only can get weekly notifications, if you are depending on these notifications to pick up harder to find Pops, they will most likely be gone by the time you get the notification. This is why the Premium subscription is so important. To set up an alert, just search for the DPCI that you are looking for and then click Create A Local Alert. Once your alert is configured you will get notifications about any changes in inventory within a 100-mile radius. We hope this clears up some of the questions that you might have with Brickseek. 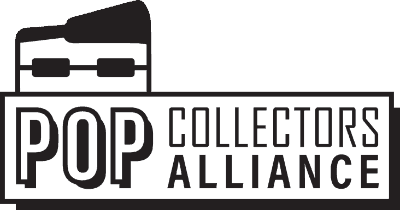 If you have any comments or suggestions for other tools or sites that you use while hunting for Funko Pops, send us an email at info@popcollectorsalliance.com or message us on our Facebook Page.